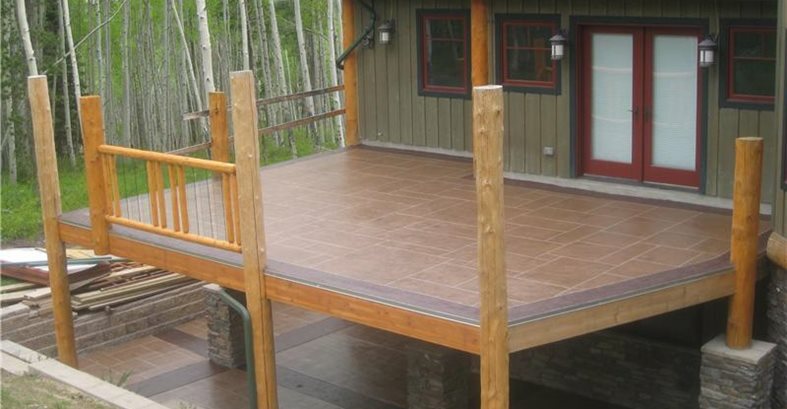 A concrete overlay made it possible to coordinate the look of this home's plywood deck with the concrete patio below Project submitted by Table Mountain Creative Concrete, Wheat Ridge, Colo. Preparation of the lower concrete patio involved grinding the slab, routing out the cracks, and then cross stitching with wire. The cracks were filled with a quick-setting repair material from CSS Polymers. Close-up of the cross stitching. 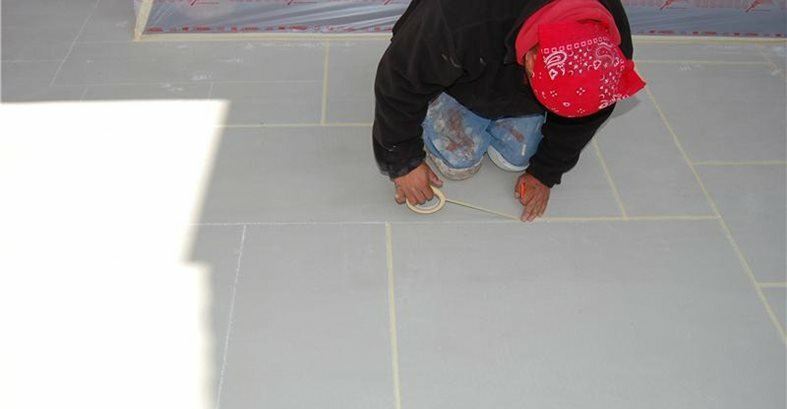 The crew trowel applies the first coat of gray Miracote MPC (Multipurpose Protective Coating). Once it cured, they sanded the surface and applied tape to create the ashlar slate pattern. A second layer of Miracote MPC, in a toffee color, is troweled over the taped areas. The pattern tape is pulled up to expose the slate pattern. 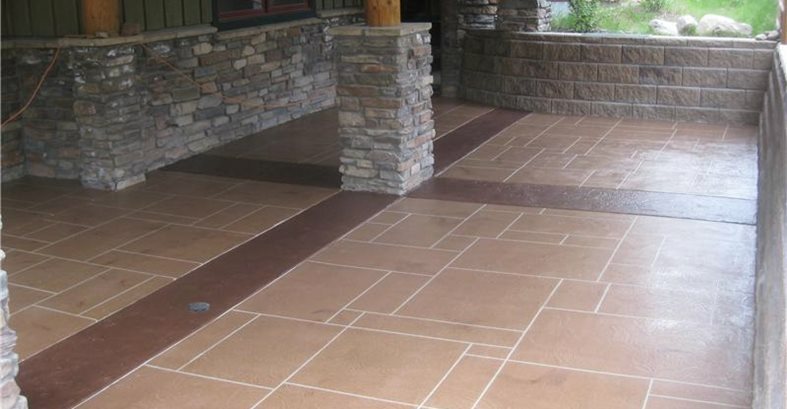 For the borders, Miracote MPC in a redwood color was applied by trowel and given a textured finish. The final results, with two coats of Miracote's HD400 semi-gloss sealer applied to bring out the rich colors. To reinforce the upper wood deck for the overlay, the crew staples down a layer of metal lath, using as many as 30 staples per square foot to ensure secure attachment. Miracote RM III repair mortar and underlayment is troweled into the lath. This will be covered by Miracote's liquid waterproofing membrane, which will prevent any water from leaking through to the patio below. The first coat or Miracote MPC has been trowel applied, and the pattern tape is going down before application of the second coat. The upper deck after application of the second layer of coating. 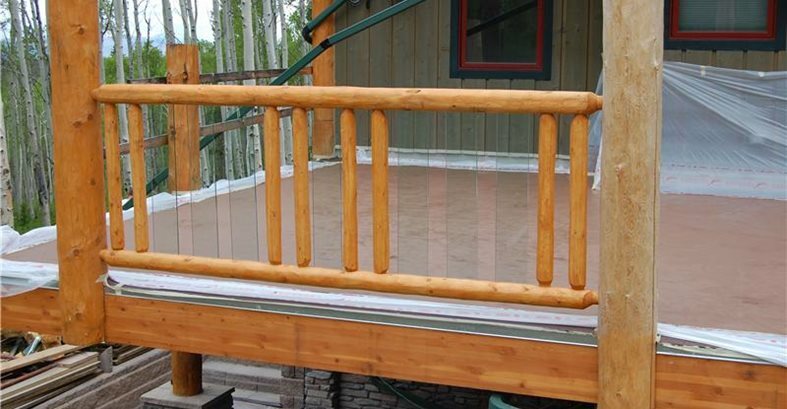 Not many homeowners are fortunate enough to have patio decks on both the upper and lower levels of their home. Yet this wonderful amenity can also pose a design dilemma if you want both decks to look the same but they are built of entirely different materials. That was the case for homeowners Patti and Mike DonMoyer of Tabernash, Colo. The newly installed upper deck of their beautiful mountain home, which overlooks a grove of aspen trees, is wood-frame construction with plywood decking. 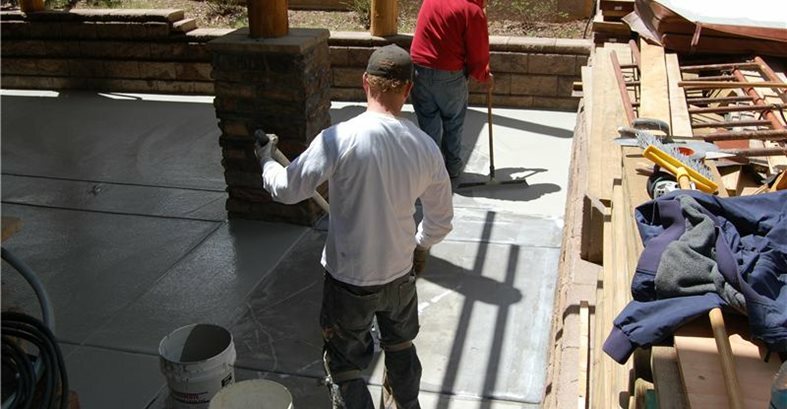 The existing patio slab directly beneath it is cast-in-place concrete. The desire was to give both decks coordinating decorative surfaces identical in pattern and color. 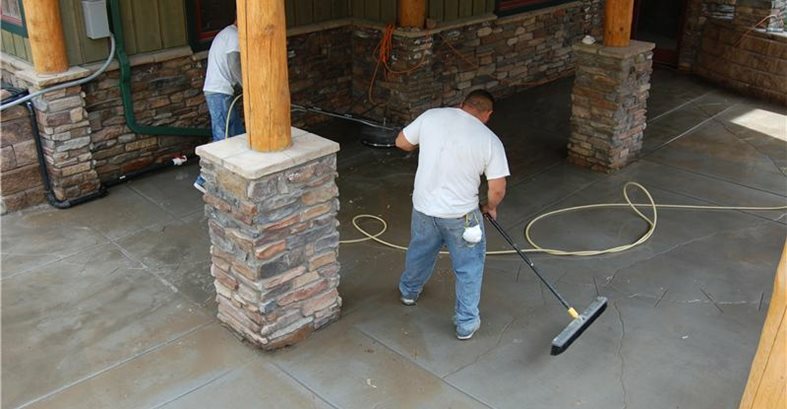 Local contractors Table Mountain Creative Concrete had the perfect solution: a waterproof cement-based overlay system suitable for installation over both wood and concrete. "Given the terraced terrain of the home, the deck and lower patio are often seen together. Patti and Mike use both levels for entertaining, so they were interested in having the two areas balance each other, using colors and patterns that would complement the house and mountain area," says Stan Squires, president of TMCC, which specializes in using overlays to transform existing concrete. 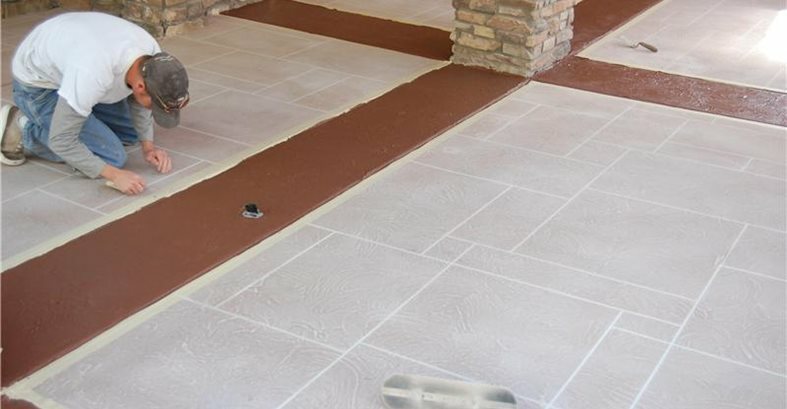 For this project, TMCC used Miracote's Miraflex II decking system, a multilayered coating combining a waterproofing membrane with a polymer-modified cement topping that can be given a variety of decorative finishes. 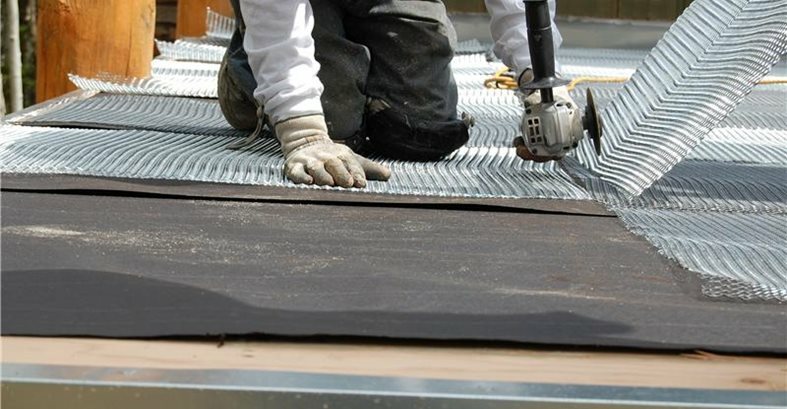 When applied to an upper-level deck, the system also protects the space underneath from water intrusion, similar to a roofing membrane. That was a big advantage on this project, making it possible for Patti and Mike to use the hot tub on their lower patio year-round — even after a heavy snowfall. "We get over 200 inches of snow during the winter," they explain. "Because we use the lower patio during the winter for our hot tub, having a solid, waterproof surface on the upper deck will keep snow and ice from building up on the patio. During the summer, it also provides a covered area during afternoon rains to sit and enjoy the outdoors." Both overlays feature a toffee-colored ashlar slate pattern (created with tape) and contrasting textured borders in a redwood shade. To protect the work and enhance the color, two coats of semi-gloss sealer were applied, with glass beads mixed in for slip resistance. 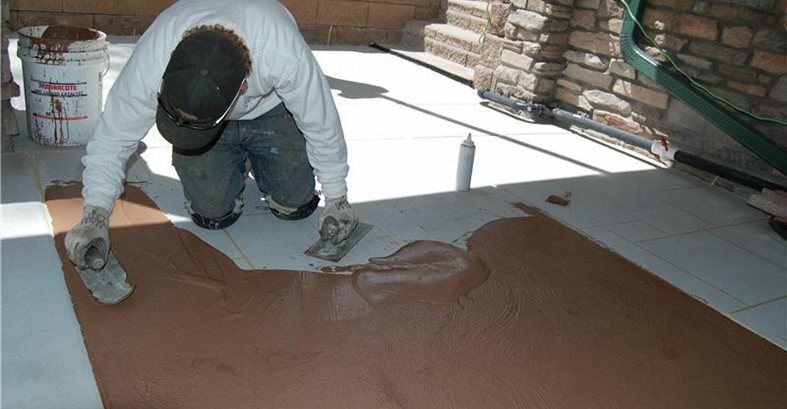 Although the steps in installing both overlays were similar, preparing the different deck surfaces for overlay application offered a distinct set of challenges. 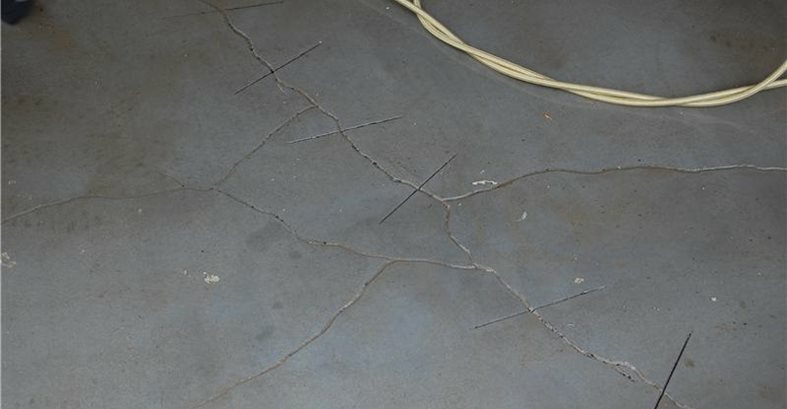 The existing concrete slab had deep cracks that required cross stitching and patching to create a smooth subbase. 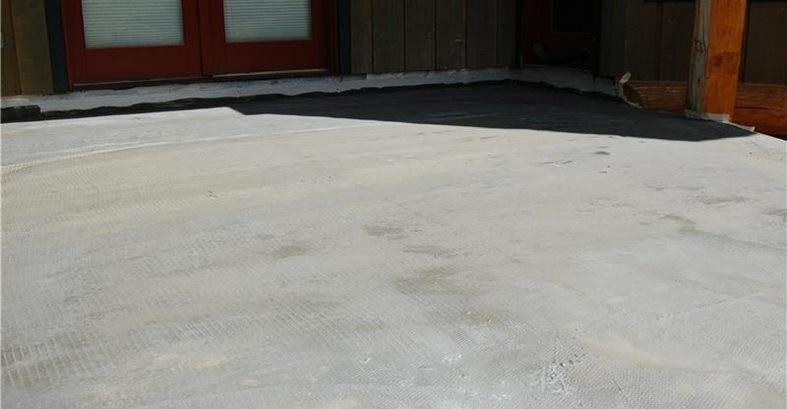 The wood deck had to be reinforced with a layer of galvanized metal lath, which was then encapsulated in a polymer-modified cementitious underlayment and covered with a liquid-applied waterproofing membrane. Watch the slideshow to see how the TMCC crew accomplished the task, successfully creating matching deck surfaces ideal for bi-level entertaining. "Soon after completion of the project, we entertained a group of 130 guests," say Patti and Mike. "Having this additional 1,100 square feet of outdoor living space made our party very enjoyable for all of our friends."